Hokkaido bears need a real wildlife sanctuary, not a zoo. In the past, indigenous Ainu treated the Hokkaido bears with respect, even incorporating them into their religious ceremonies. In today’s Japan, however, the bears are treated as a nuisance more likely to be killed than preserved as an essential part of the country’s wildlife. To be sure, these bears are neither cuddly nor cartoonish. 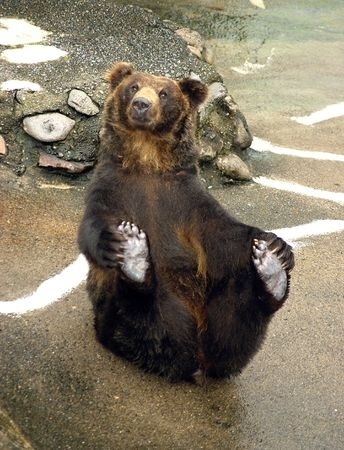 Known as “Higuma,” (also Black Grizzly, Ussuri Brown Bear, or Ezo Brown Bear) the Hokkaido Brown Bear is related to the North American Grizzly Bear and Siberian Brown Bear. They are predators not pets. And when there is a bear attack on a human, typically it’s the bear that survives the first round (only to be hunted down and killed). Regardless, civilization has not been kind to them. There are only a few thousand of these bears left in Hokkaido. Probably the safest place to see a Hokkaido bear in person is at a cramped zoo or bear park. However, few animal lovers would consider this type of captivity to be the ideal solution for saving these bears. Frankly, it’s sad to see these bears begging for tourist food in cramped spaces when they’re naturally inclined to hunt and roam for miles. The bears need a spacious wildlife sanctuary where they can be protected. As farmers and salmon fishermen encroach upon their natural habitat, there hasn’t been a concerted effort to create a natural habitat in Hokkaido where the bears can live without threatening humans or vice versa. If you would like to know about these magnificent creatures, here are some related Hokkaido Bear links you may find helpful. Legal & Policies | Privacy | Copyright © 2008-2019 Hokkaido Ventures LLC - All rights reserved.